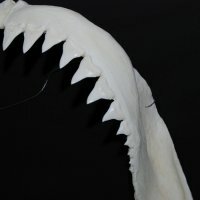 Massive Great White Shark Jaw [GWJAW18] : Fossils Online, Welcome! 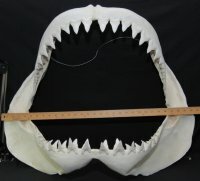 The jaws are from a 17' 11.5" female that was caught off Kangaroo Island, South Australia in 1980. This jaw once belonged to Rodney Fox. They were then sold to Gordon Hubbell a few years later. Fast forward about 20 years and I ended up with them. This amazing set of jaws measure 31" wide and 24 1/2" high. 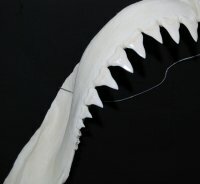 The largest upper tooth measures 2 5/16". One of the flanges was damaged and has been restored. Since Great Whites are protected, it is impossible to obtain a set of jaws unless they are from an old collection. If you are able to located one, it most likely will not be as large and will not have any data or provenience with it. Certain to go up in value, this is a great investment. Payment is by wire transfer only. I will not ship these to another country.